Si r Ranulph Fiennes set foot on the summit of Everest in the early hours of today, two failed attempts and a heart attack after he first tried to conquer the mountain in 2005. The explorer is the first man to cross the North and South Poles and climb the world's highest peak. He is also, at 65, the first British pensioner to reach the summit of Everest. Arriving at the summit just after 1am UK time, Sir Ranulph, who is attempting to raise £3 million for the cancer charity Marie Curie, said in a phone call to the BBC: "We came to the summit as dawn broke. It was very, very cold." He added in a statement that climbing Everest had long been a personal goal. In contrast to the huge publicity that surrounded his previous two attempts in 2005 and 2008, Sir Ranulph chose to keep his latest expedition low-key. Only those closest to him knew that the usually publicity-friendly record-breaker had begun yet another assault on the mountain three weeks ago – after declaring last year that he would never try again. A spokeswoman for Marie Curie said: "He wanted to do it quietly with no fuss. He only just failed last year – he got to within a short distance of the summit but had to turn back from exhaustion. "So he decided he wanted to keep it very low-key without all the build-up and media attention of last year." The full story from The Times here. 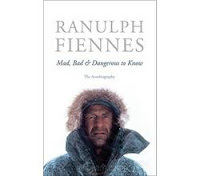 Hachette published his autobiography Mad Bad and Dangerous to Know in paperback last year, and he has a new book Mad Dogs and Englishmen due for release as a trade paperback here in New Zealand in November.